Costco is America's largest wholesale corporation and operates on a membership-only basis, selling its wares by the retail and wholesale to Costco members. Headquartered in Issaquah, Washington, the Costco brand operates a chain of over 415 warehouse locations in the United States. Costco was listed as the world's second largest retailer, after Walmart, and in 2016 Costco was listed as the world's no. 1 retail destination of choice for organic foods, wine, prime beef, and rotisserie chicken. Costco in the United States operates daily, Monday through Friday from 10:00am to 8:30pm, Saturdays from 9:30am to 7:00pm, and on Sundays from 10:00am to 6:00pm. Costco holiday hours differ on holidays like Christmas Eve (9:00am to 5:00pm), and New Year’s Eve (10:00am to 6:00pm). The warehouses remain closed on holidays like New Year’s Day, Easter, Memorial Day, Labor Day, Independence Day, Thanksgiving, and Christmas. Pleae note: The current hours should be independently verified. Costco's concept of wholesale and food court is based on the idea of its predecessor, Price Club, founded in San Diego, California, by Sol Price. The Price Club was the first chain to introduce an annual fee to its members so that they could purchase bulk products at very cheap prices. In 1993, Price Club merged with Costco and today one can find Costco locations even outside the United States, in countries like Mexico, Canada, South Korea, Japan, Australia, Spain, and the UK. One of the most unique features of Costco is that almost all of their locations feature a food court of their own – some are located outside the store and are open to the public, while some locations have an interior food court meant only for members. · America's largest pizza chains - Costco operates in over 400 locations of the United States, and most of the locations offer pizza, making Costco the 15th largest pizza chain in America as Costco operates in more locations than chains like Fox’s Pizza Den, Jet’s Pizza, and California Pizza Kitchen. · Nutrition Info - Every Costco location is open about the nutrition details of its menu items, which comes in handy for those who keep a close watch on their calories, fat, and nutrition intake. The friendly staff at Costco will hand over a copy of nutrition info for every menu item. · Costco Pizza & Chicken Bake - According to Costco, the two unhealthiest options are their pizza and chicken bake. As per the nutrition information chart, a slice of Costco's cheese pizza contains 28 grams of fat and 700 calories, while their chicken bake contains 25 grams of fat and 770 calories. · Pizzas Under a Minute - Although the pizzas are made fresh at the Costco Food Court, the entire process is completed in under a minute with the help of cutting-edge technology. 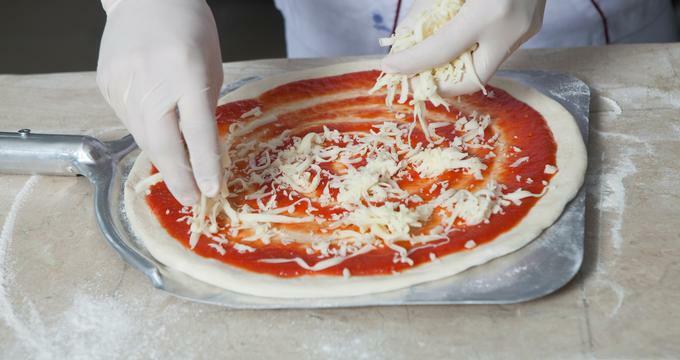 Slightly hand-stretched balls of dough are passed through a sheeter, cooked on a tray, and placed under a machine that applies sauce and cheese before giving the pizza a final bake. The entire process of pizza making can be viewed from the pick-up window at the food court. · Minimal Prices - Costco's food court is one place where the prices are maintained at a minimum and the prices rarely change. Throughout the United States, Costco's pizzas are priced at $9.99 per pie and $1.99 per slice, chicken bakes cost $2.99, while a combo meal of hot dog and soda is always priced at $1.50. · Rotating Item - Along with a list of regular menu items, Costco Food Court has one menu spot reserved for one rotating menu item. Some of the rotating menu items offered on the Costco menu include carne asada bake, turkey wrap, hot turkey, and barbecue beef brisket sandwich. · In-house Hot Dogs - Costco sells over 100 million hot dogs every year due to its popularity and low prices. In order to keep prices down and to offer good quality hot dogs at the same time, Costco makes its own hotdogs. The wholesale giant has switched brands from Coca-Cola, Pepsi, and Hebrew National and has been into selling all Kirkland Signature, their private label brand, just to avoid raising prices. · Menu Specials - Visitors get to experience unique location-specific menu specialties when they visit Costco locations in foreign countries. One gets to taste Montreal smoked meat and poutine in Canada, cottage pie and jacket potatoes the UK, bulgogi bake in South Korea, and meat pie in Australia, while Hawaii Costco offers a local noodle soup called saimin. Pizza is the most popular menu at every Costco food court and this well-deserved popularity is due not just to the pizza's cheap price tag, but also to the taste, which distinguishes Costco’s food court pizzas from the rest. Holding its stand as the 15th largest pizza chain in the United States, Costco food court serves some of the tastiest pizzas in the country. The pizzas are made with soft dough and pre-packed cheese, resulting in limp pizzas that are delicious in an extremely greasy way. The fact that the pizzas at Costco's Food Court are made fresh and taken right out of the oven gives the pizza slices a crunchy and well-made texture that is attributable only to freshly made pizzas. The pizzas are a little greasier than standard pizzas owing to the liberal portions of cheese used. Costco food court pizzas are available in three delectable variations; pepperoni, cheese, and combination, served in slices priced at $1.99 per slice, while the whole pizza measures 16 inches and is priced at $9.99 per pie. · Pepperoni pizza - Each slice of Costco pepperoni pizza has 720 calories, 68g of carbs, 1,290mg of sodium, 4g of dietary fiber, 6g of sugars, 34g of protein, 24g of total fat, 60mg of cholesterol, and 11g of saturated fat. The slice also offers 50% calcium, 20% iron, and 10% vitamin A. · Cheese pizza - Every slice of Costco cheese pizza offers 700 calories, 70g of carbs, 1,370mg of sodium, 3g of dietary fibers, 7g of sugars, 44g of protein, 28g of total fat, 14g of saturated fat, 14g of monounsaturated fat, 3g of polyunsaturated, and 1g of trans fat. The slice also offers 80% calcium, 20% iron, and 15% vitamin A. · Combination pizza - One slice of Costco’s combination pizza has 680 calories, 72g of carbs, 1,540mg of sodium, 4g of dietary fiber, 8g of sugars, 36g of protein, 29g of total fat, and 65mg of cholesterol. The slice also consists of 50% calcium, 25% iron, and 15% vitamin A.